April | 2010 | Historic Vienna Inc. The Freeman Store and Museum’s National Register Plaque Dedication! Historic Vienna, Inc. and the Town of Vienna invite you to celebrate the unveiling and dedication of a plaque recognizing the addition of the Freeman Store to the National Register of Historic Places. The ceremony will take place on Saturday, April 6, on the front porch and side lawn of the Freeman Store at 2 pm, with a variety of events on-going throughout the day. Following the presentation of colors and welcoming remarks by Vienna Mayor M. Jane Seeman, speakers will include Delegate Mark Keam, State Senator Chap Peterson and Congressman Gerald Connolly. A reception will follow on the side lawn of the Freeman Store. The Freeman Store was built in 1859 by Abram and Susan Lydecker and has played many roles in Vienna’s history. Notably, it was one of the polling stations at which Fairfax residents in 1861 cast ballots on the issue of secession from the Union and registered 77 to 44 not to do so. 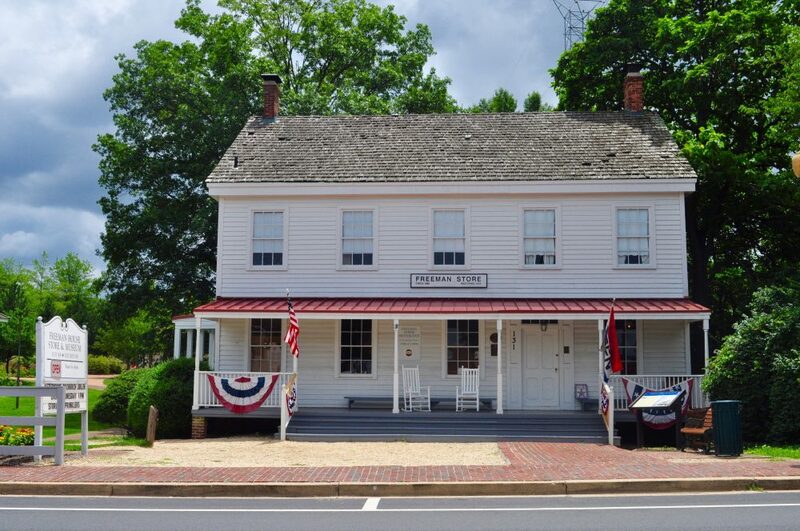 In addition to its primary function as a store and residence, the Freeman Store has been a military headquarters and hospital and a post office. The Freeman’s grandson Leon Freeman not only continued the family business but also served as a director of Vienna’s first bank, Mayor of Vienna and member of the Virginia House of Delegates and, notably, founded the Vienna Volunteer Fire Department. Purchased by the Town in 1969, the structure was restored as a National Bicentennial Project. It is leased to Historic Vienna, Inc., which owns all of the interior furniture, collections and fixtures and whose Storekeeper and volunteers operate the Freeman Store, maintain the collection of artifacts and mount educational exhibits. The Store was placed on the Virginia Landmarks Register in 2012 by the Virginia Department of Historic Resources. All of the activities associated with the unveiling and dedication ceremony are free and open to the public. For more information, please call (703) 938-5187 or (703) 255-6360.